As Psalm 122:6 states we as believers should "Pray for the Peace of Jerusalem, they shall prosper that love thee" This biblically fragrant oil is in the beautiful fragrance of Frankincense & Myrrh and should be a daily reminder to do as the scripture admonishes us to "Pray for the Peace of Jerusalem"
NEW- PRAY FOR THE PEACE! Our 4 oz Frankincense & Myrrh Anointing Oil is now offered in a glass amber container with a beautiful, gold-embossed label reminding all who see it to "Pray for the Peace of Jerusalem". 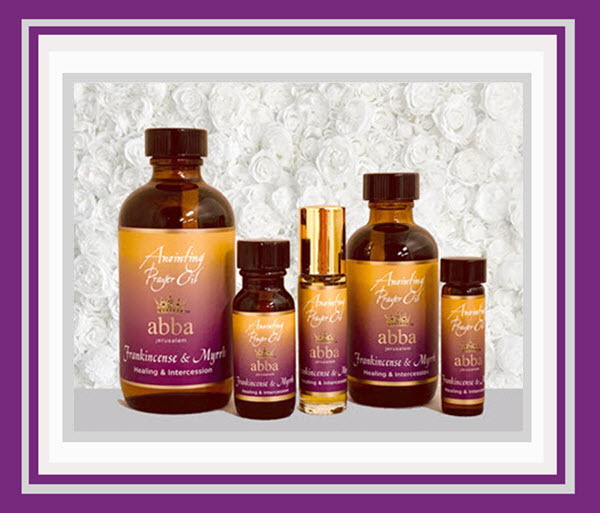 Abba's Frankincense & Myrrh anointing oil is a unique blend of pure olive oil from Israel with an essential oil base of Frankincense & a small amount of Myrrh.